4 to 6 hours approx. Departure time at 8:00pm but we will confirm the pickup time when we confirm the tour. Check for more details below. Join us for one of the most unique and memorable Aurora Borealis - Northern Lights photography tour you will ever experience. We will take you to personally scouted locations for the best chance to see the northern lights and the nightscape of Iceland. Our northern lights tour depends on the weather forecasts from 3 different sources in the days before your tour to maximize your chance of catching this phenomenon. With us, you will also learn how and where to enjoy and photograph the fabulous nightscapes of Iceland and the colorful dance of the northern lights, one of the foremost wonders of the natural world. After picking you up, we head out on the hunt of a lifetime, visiting the best locations within a 45km/27mi radius of Reykjavik. The final choice of location depends on weather, wind, cloud cover etc. The success of a night’s Aurora hunting depends on many things, so you learn about the required equipment and camera settings, how to prepare for the right moment and judge the strength of the Aurora to make sure you bring home the best possible shot. Aurora strength depends on solar activity in the days prior to the tour and we do our tours based on those readings. 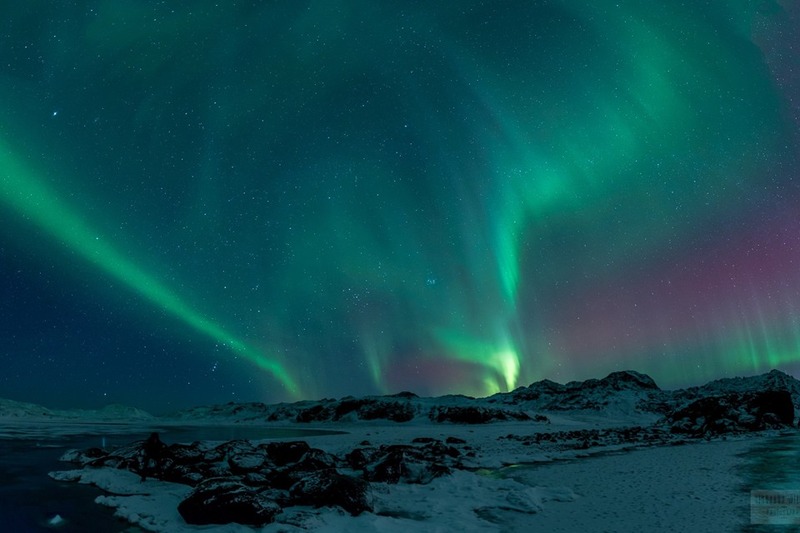 The Icelandic weather is famous for being constantly changing with cloud cover affecting our view of the sky, stars and of course the northern Lights. That is why we cannot guarantee that we will catch lights, but with us you will maximize your chances and be in the right spot to photograph them when they show up. We offer a second try if we are unable to catch the lights on the first night (valid for up to 2 years from tour date). We will contact you the day before the first possible tour date or in some cases after 6pm (18:00) on the first possible tour date to let you know if the tour is on or not. Personal experience with a small group of people (only 1-12 people per tour). Pickup and Drop-off at your accommodations in the Reykjavik area. Personal guidance with your camera from a professional photographer. Hot chocolate to warm you up. A shot of our signature spirit for those that want something stronger. Photos of you with the northern lights in the background taken by a professional photographer. 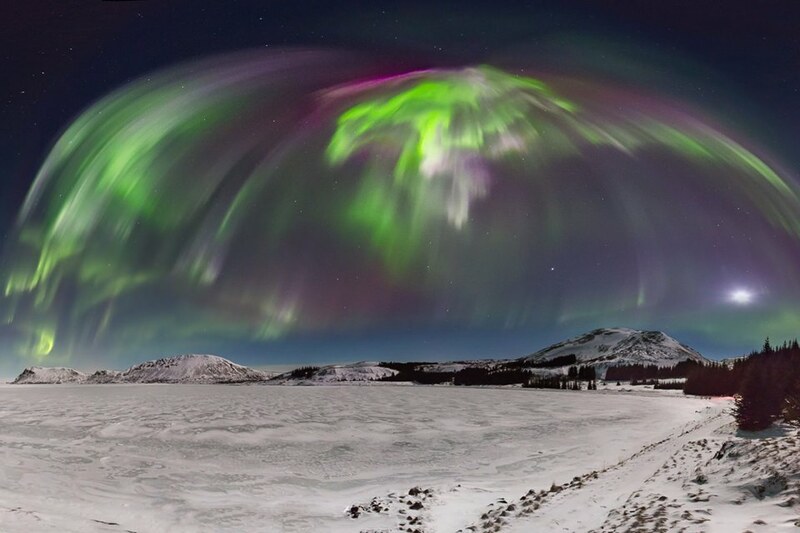 Photos of the northern lights taken by a professional photographer. 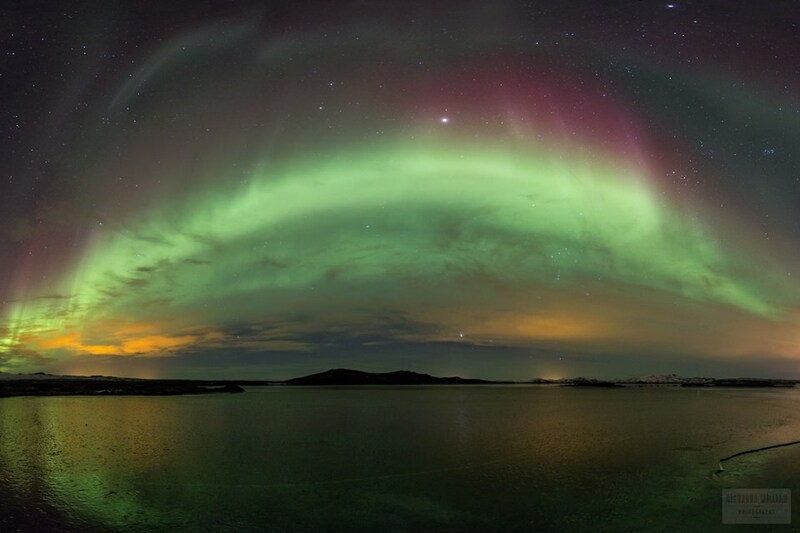 The northern lights hunt of a lifetime guided by a veteran aurora hunter. Certified tour guides from the Icelandic tourist board. You will get an unlimited access to tips, tricks and our personal knowledge/experience of nighttime photography. Experience the emotions that only the northern lights and the Icelandic skies can generate. Come and join us, bring your camera and get the shots of a lifetime! Please add more dates in the message box below. We will help you pick the best one when we have the latest forecasts. To message you with updates. A tripod is needed to photograph the northern lights and are available for rent if ordered in advance at ISK 2,500 each. You can book the northern lights tour as private. You get the 4x4 to yourselves with the flexibility of your own pickup and drop-off time. Northern lights are weather dependent. So please be flexible to go for northern lights hunting one or two nights before or after the date you booked in the event that weather conditions are more favorable. We accept photographers from beginners to professionals. Those that are not photographers and only want to chase the lights with us can get a photo taken of themselves with the northern lights (included in the price). Dress warmly and bring waterproof clothes if possible. We will stop at shops where you can buy something to eat and drink. Hi, we are guides and professional photographers certified by the Icelandic Tourist Board. We are passionate about landscape and particularly nightscape photography. Nothing beats venturing out into the immensity of the Icelandic sky to hunt the northern lights! Snæfellsness, Reykjanes peninsula and South coast photography. Please contact for information. Pickup and drop off at your hotel in the Reykjavik area included. Pickup starts 15 minutes before set time and can take up to 30 minutes.